If your site is a User or Organization Page that has a repository named <username>. [hostname]or <orgname>. [hostname], you cannot publish your site&apos;s source files from different locations. User and Organization Pages that have this type of repository name are only published from the master branch. 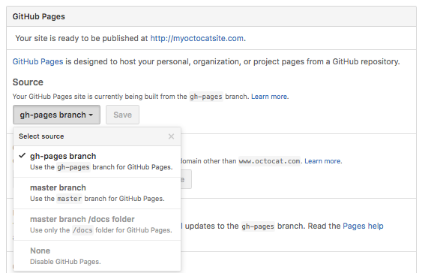 For more information about the different types of GitHub Pages sites, see "User, Organization, and Project Pages." The default settings for publishing your site&apos;s source files depend on your site type and the branches you have in your site repository. If your site repository doesn&apos;t have a master or gh-pages branch, your GitHub Pages publishing source is set to None and your site is not published. After you&apos;ve created either a master or gh-pages branch, you can set one as your publishing source so that your site will be published. If you fork or upload your site repository with only a master or gh-pages branch, your site&apos;s source setting will automatically be enabled for that branch. To select master or gh-pages as your publishing source, you must have the branch present in your repository. If you don&apos;t have a master or gh-pages branch, you can create them and then return to source settings to change your publishing source. On GitHub Enterprise, navigate to your GitHub Pages site&apos;s repository. Use the Select source drop-down menu to select master or gh-pages as your GitHub Pages publishing source. Tip: If you remove the /docs folder from the master branch after it&apos;s enabled, your site won&apos;t build and you&apos;ll get a page build error message for a missing /docs folder. Create a folder in the root of your repository on the master branch called /docs. 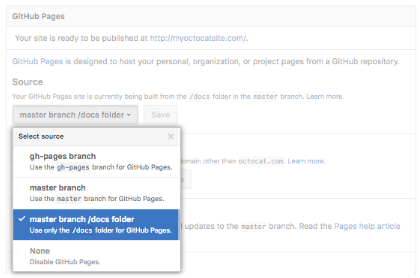 Use the Select source drop-down menu to select master branch /docs folder as your GitHub Pages publishing source. Tip: The master branch /docs folder source setting will not appear as an option if the /docs folder doesn&apos;t exist on the master branch.